“We are all guilty. We have the tools and resources to protect children, even in situations of armed conflict; but we have not been able to do it. We need to act now.” Gamba, V.
Ambition and interest, as well as mistrust and suspicion have been the cause of huge violations of human rights. In the news as well as on social networks, we hear how the world “falls apart”. But it hurts in the soul, knowing that our children and young people, “the most vulnerable group in our society” are being used as objects for these atrocities. 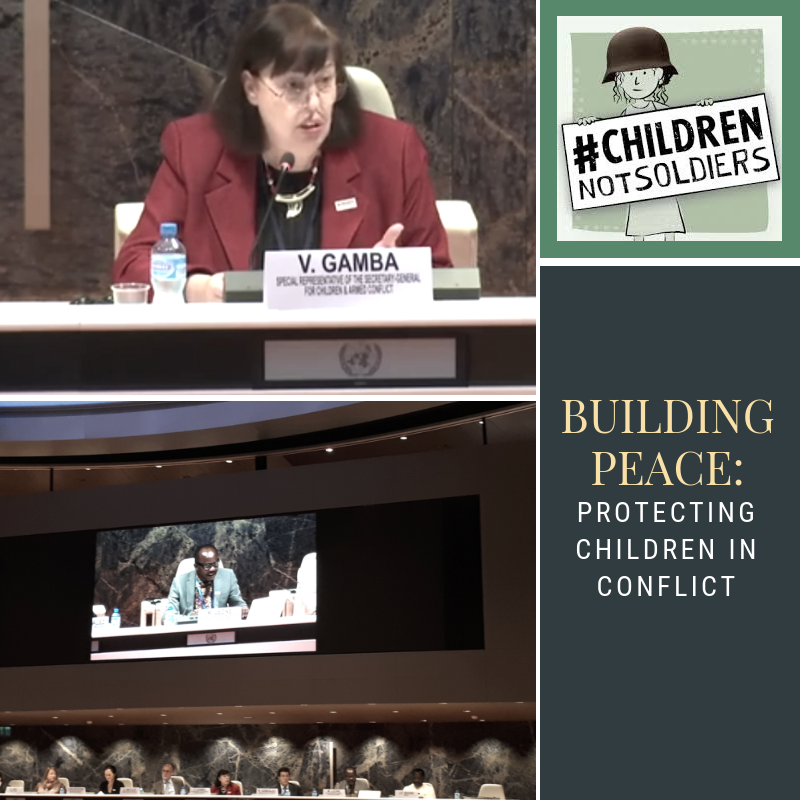 The hashtag #ChildrenNotSoldiers overran Room XVII in Palais de Nations at the event “Building Peace: Protecting Children in Conflict” on November 5th, in the context of the Geneva Peace Week. This event showed that to build sustainable peace, it is necessary to prevent and to put end to the violations against children who are in situations of armed conflict. With the existence of the Convention on the Rights of the Child, which has been ratified by most of the Member States of the UN, it is surprising that there are still children whose rights are systematically ignored and violated. Children and young people have become the main fuel of armed groups, which not only steal their opportunity to study, to enjoy and to be in their community, they also steal their freedom and, worse, steal their childhood. It is evident that armed conflicts have a negative impact on our children, because the price is children’s lives. Ms. Virginia Gamba is the special representative of the Secretary General for children and armed conflict, she has a long career in matters of peace and security, human security and disarmament. She presented her office as a “global megaphone” to identify human rights violations in armed conflicts and to build a sustainable platform that allows the end of these violations and the prevention in future occasions. Ms. Gamba expressed with extreme clarity and pain that the international community is not ready to help the children who are victims of these abuses. Ms. Nathalie Ben Zakour Man, Mr. Hichem Khadhraoui and Ms. Erica Hall, representatives of MINUSCA and some NGOs that work in the field with children and young people in situations of armed conflict, presented the challenges that they face every day. Armed conflicts cause fear, insecurity, absence of students and teachers in schools, discontinuity of classes and destruction of material and infrastructures. Poverty, lack of educational opportunities, violence and insecurity are some of the most common elements that lead young people and children to join to these armed groups. The reintegration of the victims, after a conflict, was also shown as one of the greatest challenges to build a peaceful society, defining peace not only as the absence of conflict, but as “a place where people can enjoy their rights in harmony”. The interventions of the panellists, who spoke not only from the heart but also with acquired knowledge, motivated NGOs present to participate in the interactive dialogue. The NGOs showed interest in creating new channels of cooperation with UN Offices to safeguard and protect youth and children. We must recognize that children are not in the peripheries of the armed conflicts, but in the middle of them. Remembering that civil society not only knows the reality in the field, but also has the role of advocating the government to put an end to the violations and abuses against human rights and must help with social reintegration of the victims. By investing in education of our children and youth, we will assure the future of our generation and the construction of sustainable peace. We have to make sure that different measures work together: individual and collective, moral and material, political and social. For us, education is a key element to build a sustainable and peaceful society. Education put the eyes on the future, promoting values such as inclusion, coexistence and respect. Education is, in short, one of the most powerful tools to end armed conflicts. It is time for the international community to realise that the number of children suffering from armed conflict is increasing every day. It is not enough to complain about the tragedies that are known, this abhorrent reality has to move political will power to put into practice the measures and the mechanisms that will stop these abuses.